Most women I know are either missing bread…or missing not feeling guilty when they eat it. 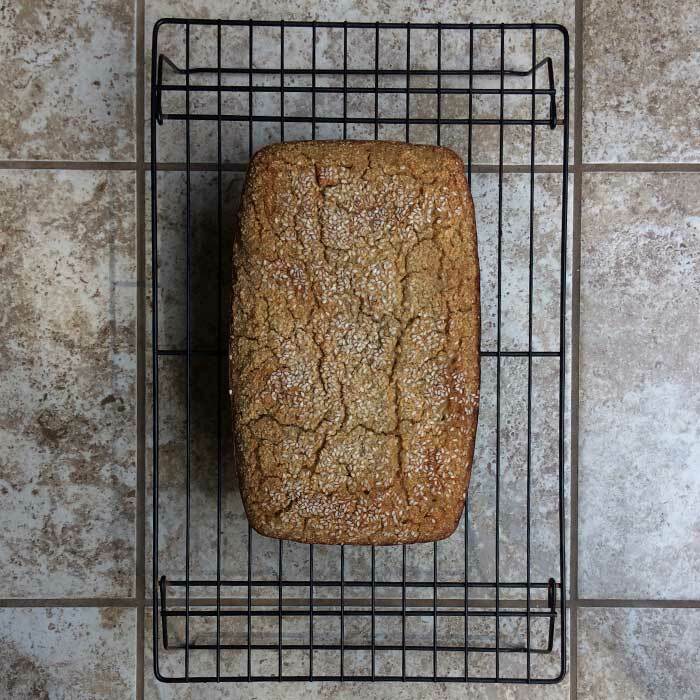 But I am neither…mostly because of this great gluten-free, fermented bread recipe. It doesn’t even use flour. Just whole grains. Wait. I know that sounds crazy. But sourdough is fermented, right? Stick with me here. It’s dead simple. Put 3 cups of whole grains in a bowl. It can be any combination but I usually do 1 cup of brown rice, 1 cup of buckwheat and 1 cup of either millet or quinoa. Cover with water. Let this bowl sit on your counter overnight. 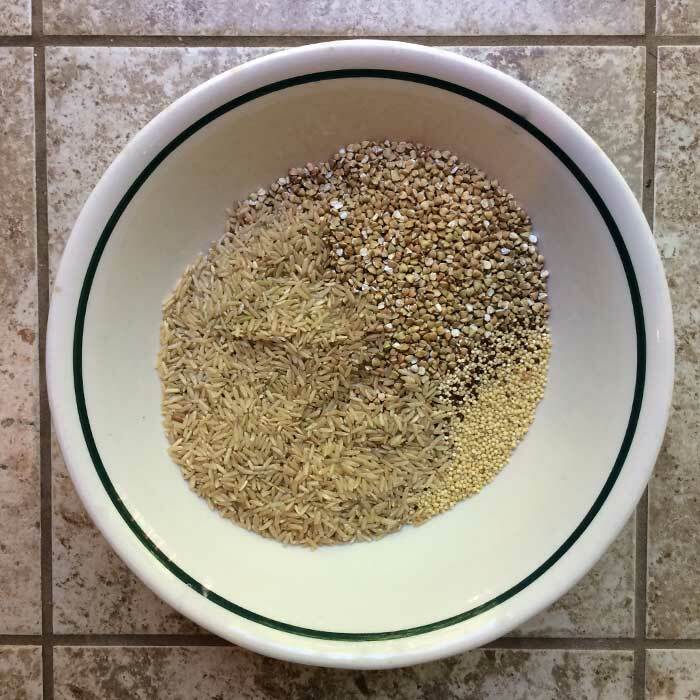 Strain and place whole grains into a food processor with about 1 cup of fresh water and 1-2 tsp. salt. Blend well. It should be thick like a batter. Scrape this batter into a bowl and cover with a kitchen towel. Let it sit at room temperature for 24-48 hours. 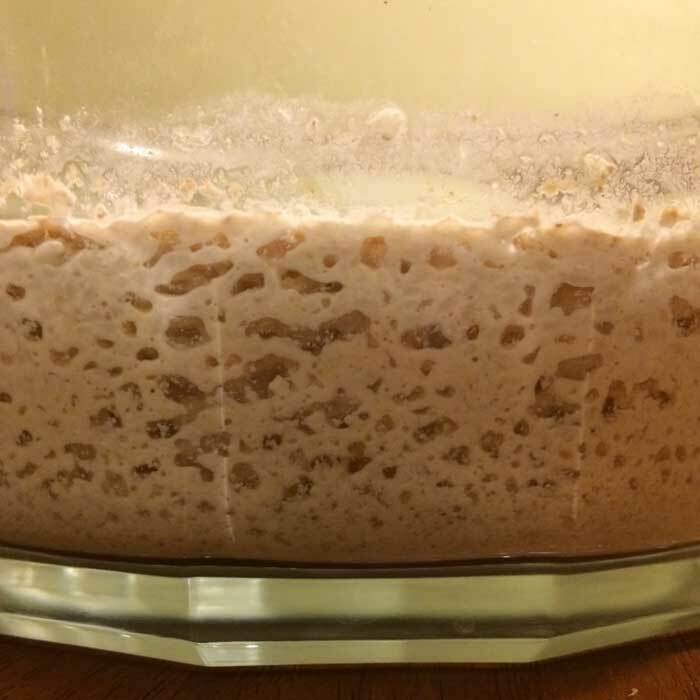 It will rise and start to smell yeasty. Here is a side view so you can see the bubbles forming! Prepare a loaf pan and pour batter into it. Bake at 400F until golden brown and the top looks cracked. That’s it! I love it sliced and toasted with a schmear of cream cheese or butter. It’s not going to rise into the shape of sandwich bread, but you could certainly make an elongated-looking sandwich. And if you’re worried about the carbs…don’t be. These are the kind of carbs your body needs. 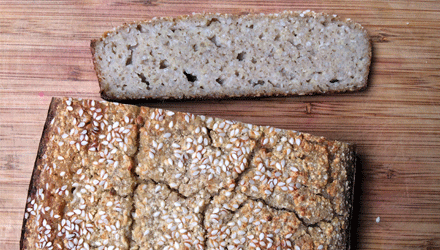 They’re whole grains, and fermented to boot! Let’s talk about this fermented thing. That doesn’t mean you’re getting live, healthy bacteria like you would from eating lactofermented veggies or taking a probiotic pill. Because the bread is cooked, the bacteria are not still alive. In the case of bread, the fermentation process helps “pre-digest” or break down the grains and make their nutritional value more accessible. Plus, because it’s a wild fermentation process there’s no yeast required. So it’s a good thing, but it doesn’t replace your probiotics. Got it? No matter how “healthy” it is…no one is saying you should eat the whole loaf in one sitting (yikes!) but I like to enjoy a slice with breakfast or lunch. It’s good, satisfying food. Rinse all grains, cover with water, and soak overnight in a large bowl. Combine grains with ¾ –1 cup of fresh water and sea salt and blend in food processor or blender until it reaches a loose toothpaste consistency. 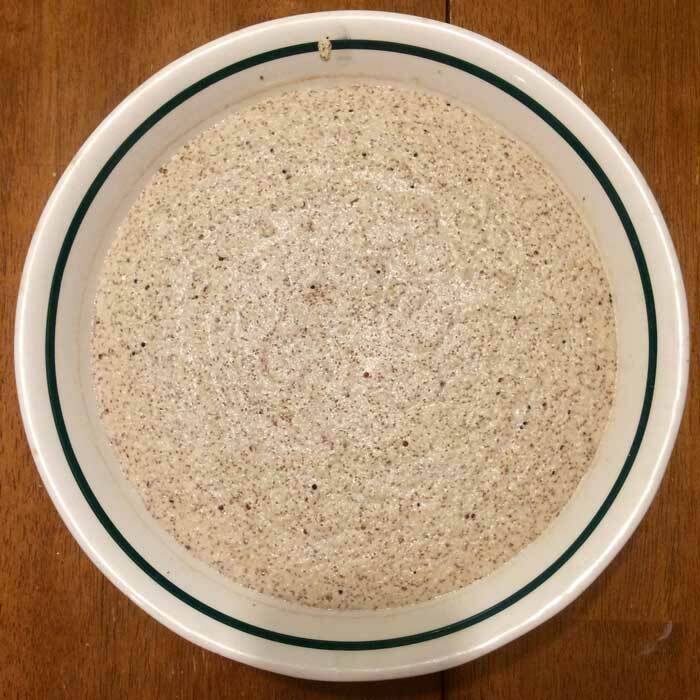 Pour the batter into a bowl, cover with a clean dish cloth, and leave out at room temperature for approximately 24 -48 hours to ferment. Note: I like to mix the batter once around the 24 hour mark to mix in any hooch that might be on top of the batter. You’ll notice it because it will be darker than the batter…almost a purplish color. Just mix it back in and let it rise again. Preheat oven to 400F. 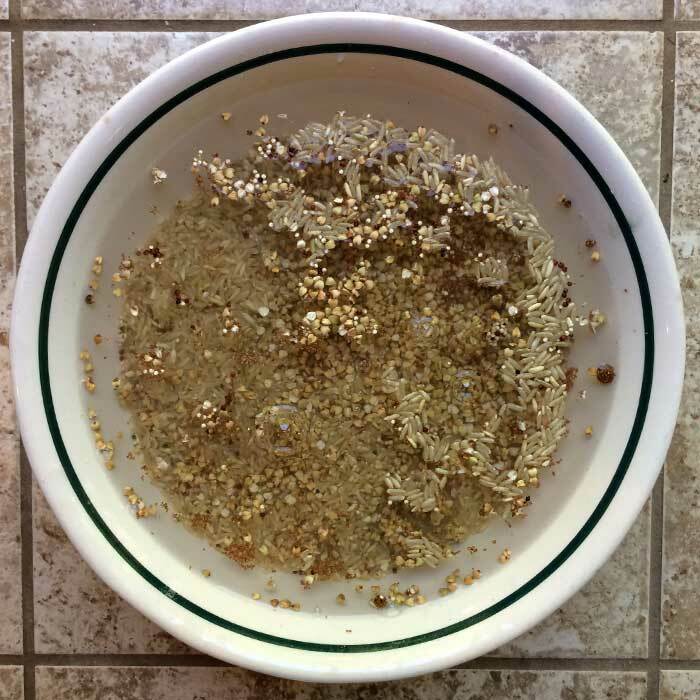 Grease a loaf pan and then sprinkle a mix of seeds in the bottom of the pan. This helps the bread to not stick. Before you pour the batter into the pan, add a couple Tbsp. of any other seeds you want. Once the seeds are mixed, pour the batter in the loaf pan and place in the oven. Baking usually takes 45-60 minutes (Note from Michelle: mine only takes 25 minutes!) It's done when it's golden brown on top, usually the top of the bread is cracked, and if you stick a toothpick in it will come out clean. Remove from oven and allow bread to cool for at least 1 hour before removing from pan. Once completely cool, slice bread and enjoy, either plain or toasted.